It is a very sturdy , hearty and sound dog. Sarplaninci are very enduring. The normal gait is high trot, well covering the ground. The dog is very courageous, very intelligent, very stable, proud, dominant, very watchful, alert and much aloof with strangers. 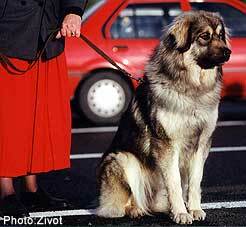 Its inborn territorial trend makes for a good watch and protection dog , aloof and autonomous. The traits we just depicted, added to its strengh, agility and velocity in both scheming and handling turn it into one of the best and most reliable watchdog , in existence to-day. It is a dog which training is not easy, due to its steadiness. It is therefore most important to be firm, just and very consequent, never showing any hesitation. Sarplaninci must feel they have a fair master, if not, they will take the leadership. All must be done quietly but firmly. Corporal punishment can bring resentment or break the young Sarplaninac's temperal together.